Who is the Amazing V? Father of three, he took up magic to entertain and amaze his daughter and two sons. The wow in their eyes was enough to make him learn more. By day, he is a High School science teacher in the <?xml:namespace prefix = st1 ns = "urn:schemas-microsoft-com:office:smarttags" />Toms River School district, but when he puts on his magic hat, anything is possible. His interest in magic goes back to the days of his childhood as he watched in wonder as things disappeared and reappeared from no where in a magician’s hands. Today he wants to share magic with people of all ages. For him, magic is a way to allow people to suspend their belief, even for just a moment. To allow them to wonder. A sense of wonder is one of the first things children and adults lose in this fast paced technological world. The Amazing V is your local magician. "Because this is a part-time endeavor for me, I am able to charge lower fees and still bring quality shows to you. My shows are always fresh and I am not rushing off to other bookings before your show is done. I am all there for every show all of the time. Many full time magicians are mentally off to the next show, while performing on autopilot for your audience. " Over 20 years working with children. 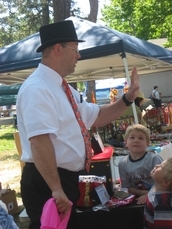 "I do over 50-well practiced shows a year and have extensive experience engaging and entertaining children. In �real� life, I am a teacher with the Toms River Regional Schools and have worked in education for the past 25 years."